We went to the book presentation organised by the IFK (International Research Center for Cultural Studies) on the occasion of the book's translation into German. 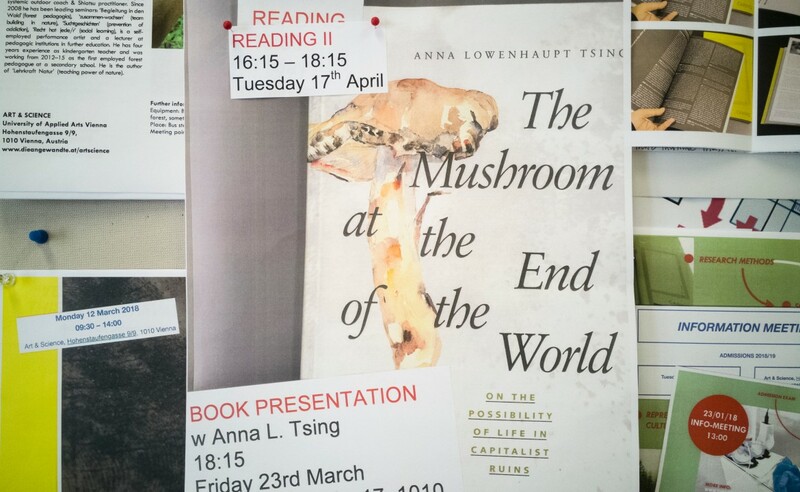 A conversation between Anna L. Tsing and anthropologist Andre Gingrich, as part of the German translation of her book 'The Mushroom at the End of the World. On the Possibility of Life in Capitalist Ruins' (Translation: Dirk Höfer, published by Matthes & Seitz 2018). In the announcement of the publishing house, the book is described, inter alia, with the following sentences: "The first new life that arose after the nuclear disaster in Hiroshima was a mushroom. A Matsutake that grew on the contaminated rubble of the city - one of the most valued edible mushrooms in Asia, not only found in Japan, where it invokes peak prices, but spread throughout the Northern Hemisphere. This strongly smelling mushroom prefers to grow on soils devastated and ruined by the industrialization and is not cultivable. In her fascinating kaleidoscopic essay, anthropologist Anna Lowenhaupt Tsing investigates the traces of this fungus as well as its biological and cultural spread, thus exploring the possibilities of living in a human-destroyed environment. Anna L. Tsing is Professor of Cultural Anthropology at the University of California, Santa Cruz and Niels Bohr Professor at Aarhus University in Denmark. She has published "Friction: An Ethnography of Global Connection" (2005) and published "Words in Motion: Toward a Global Lexicon" (2009) with Carol Gluck.